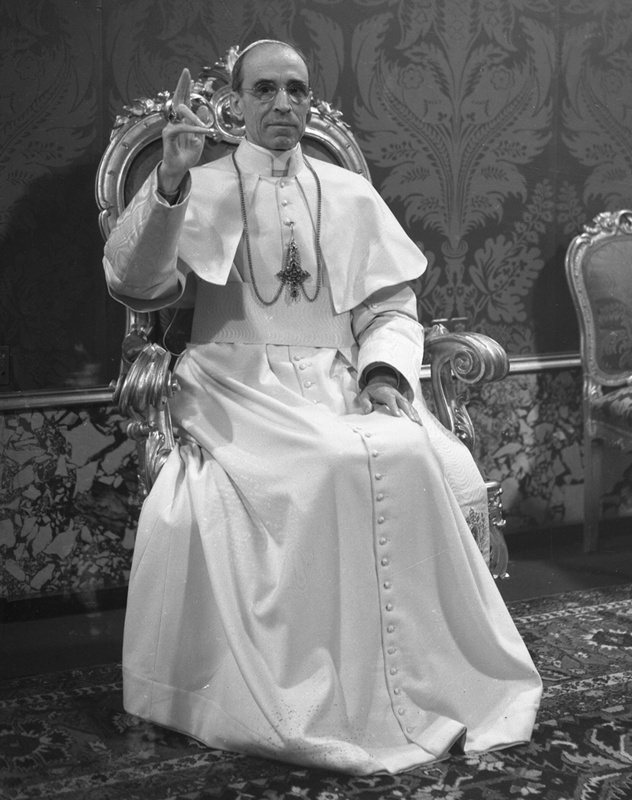 Pope Pius XII, who led the Catholic Church from 1939 to 1958, is pictured in this undated photo at the Vatican. Pope Francis announced March 4 that all the documents on Pope Pius in the Vatican Secret Archives will be made available to researchers starting March 2, 2020. VATICAN CITY — Declaring that the Catholic Church is unafraid of history, Pope Francis announced that documents in the Vatican Secret Archives relating to the wartime pontificate of Pope Pius XII will be open to scholars in 2020. Researchers, particularly those interested in Catholic-Jewish relations, have pressed the Vatican to open the archives and allow a full study of Pope Pius’ actions during the war, including what he did or failed to do for Jews during the Holocaust. “The Church is not afraid of history, on the contrary, she loves it and would like to love it more and better, just as she loves God. Therefore, with the same confidence as my predecessors, I open and entrust to researchers” this wealth of documents, the pope said. The pope met March 4 with supervisors, staff members and assistants working at the Vatican Secret Archives during an audience to mark the 80th anniversary of Pope Pius XII’s election March 2, 1939. Staff at the Vatican Secret Archives, which holds the bulk of the documents related to the wartime pope, have been working for the past 13 years to get the material organized, cataloged and accessible to researchers. Bishop Sergio Pagano, prefect of the archives, said the years of work were necessary to pull together and catalog material previously held in a variety of Vatican offices; this includes documents from the Vatican Secretariat of State, the Congregation for the Doctrine of the Faith, records from Vatican nunciatures around the world and thousands of notes regarding Pope Pius’ charitable activity in Italy and abroad. Pope Pius, who guided the universal Church during World War II, already has been a subject of intense study and discussion, “even criticized — one could say with some bias or exaggeration,” Pope Francis said. While a small portion of material produced during the pontificate of Pope Pius has been made available, all documents in the archives from his election in 1939 to his death in 1958 will be made available to researchers starting March 2, 2020. The pope thanked the staff for their work, their assistance to the world’s researchers and for the future publication of important sources related to the late pope. The normal Vatican practice is to catalog and open all the archival material from an entire pontificate at the same time. In 2006 Pope Benedict XVI authorized the archives to make available to researchers all the documentation from the pre-World War II pontificate of Pope Pius XI up until 1939. In 1965 St. Paul VI ordered the scholars to search the archives for evidence to rebut claims about his predecessor’s allegedly negligent conduct during the war. The claims were made by Rolf Hochhuth, a German and author of a 1963 play called “The Deputy,” in which Pope Pius was depicted as a coward who did not stand up to Adolf Hitler. The volumes were digitized with the help of the Pave the Way Foundation, whose president, Gary Krupp, seeks to redress what he says are serious misunderstandings about Pope Pius’ role during the war. Krupp says the documents show that the pope did much to help Jews, often acting quietly behind the scenes to avoid reprisals by the Nazis against Jews.